SAN LUIS OBISPO, CA (February 12, 2019) – The San Luis Obispo Children’s Museum is planning to wow guests with two new exhibits that will be installed later this year: Fundraising is now underway to complete the large-scale exhibits: a whimsical Mist Garden in the outdoor playscape and a STEM-based Mission to Mars exhibit for the first floor. Recently, the Board of Directors added two new members to its ranks and elected a new executive team. Ann Dinh and Matt Pearce have been elected to three-year terms. Re-elected officers include Lisa Rizzo (president), Courtney Anderson (vice president), Craig Filipponi (treasurer) and Lindsay Waylett (secretary). Returning directors include Annie Braff (event chair), Linda Minton, Shelley McConnell, Colby Courter, Kelli Fite and Maureen Vazquez. Ann Dinh is a trauma nurse who is taking time from her career to raise her young daughter, Ellie. Ann is married to pediatric dentist, Vik Tiku. Since becoming a mother, Ann greatly enjoys seeing the world from a child’s point of view and is excited to be a part of an organization that helps foster children’s learning, development and curiosity. Ann is looking forward to leading the Exhibits Committee during 2019. Matt Pearce owns Old San Luis BBQ Co., a downtown neighbor of the Children’s Museum. He has a son and daughter with his wife, Danae, and enjoys sharing his love of local cuisine with locals and visitors alike. In addition to helping to guide SLOCM, Matt will be spending the coming year opening a new SLO BBQ location at 3870 Broad St. The Children’s Museum now counts more than six hundred households as members. The Museum supports the community by hosting free nights each month (sponsored by Lindamood-Bell learning Processes during 2019), sensory-sensitive nights for children on the autism spectrum quarterly, and donates hundreds of admission passes to youth-serving organizations state-wide. The San Luis Obispo Children’s Museum inspires learning through play for children ages 2-10, and is located at 1010 Nipomo Street in downtown San Luis Obispo. Visit www.slocm.org for visitor and program information. SAN LUIS OBISPO, CA (January 24, 2018) – The San Luis Obispo Children’s Museum Board of Directors recently welcomed two new members to its ranks and elected a new executive team. Dr. Vik Tiku and Kelli Fite have been elected to three-year terms. Newly elected officers include Lisa Rizzo (president), Courtney Anderson (vice president), Craig Filipponi (treasurer), Lindsay Waylett (secretary). Returning directors include Lindsey Haring (exhibits chair), Annie Braff (event chair), Linda Minton, Dawn Hinchman and Byron McFarland. Dr. Vik Tiku, owner and dentist at SLO Pediatric Dental, grew up in Camarillo, attended Dartmouth College, and earned his dental degree at the University of the Pacific in San Francisco. Kelli Fite serves as Senior Vice President, Chief Operations Officer for SESLOC Federal Credit Union. She grew her career in Southern California before returning to her hometown of Arroyo Grande to raise her son. During 2017, the Old SLO Western Town exhibit was unveiled, and the Central Coast Pediatrics-sponsored medical office exhibit was completely renovated and renamed SLO Town Pediatrics. Hundreds of families are now members of the Children’s Museum. Members receive unlimited visits, discounts for birthday parties & guest admission, and half off admission at 200-plus children’s museums nationwide. Through the Museum’s monthly Moonlight Hours program, more than 24,000 guests have visited free of charge since the Museum’s reopening in 2008. San Luis Obispo, CA— The San Luis Obispo Children's Museum will hold its annual fundraiser, "Woody’s Round Up,” Friday, October 27 with all proceeds benefitting the Museum and its many exciting exhibits, programs, activities and events. Dress as your favorite Toy Story character, bend an elbow at the saloon, play games & dance, enjoy delicious grub, and bid on unique auction items – all in a playful western theme. Board member emeritus, Missy Reitner-Cameron, will be honored for her many years of service to the Children’s Museum. The Children’s Museum is grateful to all of its event sponsors, particularly title sponsor Lindamood-Bell Learning Processes. Special thanks to iii DESiGN, Glenn Burdette, iPromote, San Luis Pediatric Dental, Dylan & Sheri Robesky, SESLOC Federal Credit Union, MindSplash, Colleen Gnos Art, Opolo Vineyards, Science After Dark, Lola Red Design Group, SLO Brew, PrintPal Promotions & Printing, DiBuduo & DeFendis and Jeff Priolo, Coast 104.5 FM, Quota International of San Luis Obispo, Inhouse Security, Hep Kat Clothing, Bill Gaines Audio and ACI Jet. This wild adults-only ride begins at 5:30 p.m. in the SLO Vets Hall. For more information and tickets call 545-5874 or log onto www.slocm.org/woody. San Luis Obispo-- - Today the San Luis Obispo Children’s Museum announced that it has joined Museums for All, a signature access program of the Association of Children’s Museums (ACM) and the Institute of Museum and Library Services (IMLS), to encourage families of all backgrounds to visit museums regularly and build lifelong museum habits. The program will run through 2017 and enables low-income families to visit the Museum for a minimal fee of $3 per person when they present an Electronic Benefits Transfer (EBT) card. Museums for All is part of the San Luis Obispo Children’s Museum’s broad commitment to include and welcome all. The goal of the Museums for All initiative is to reach more children and parents, especially those living in poverty. The San Luis Obispo Children’s Museum, with its focus on bringing children and families together, is committed to providing access to valuable learning resources for all San Luis Obispo County families. Each year, children’s museums host more than 31 million visitors and SLOCM welcomed more than 55,000 guests in 2016. The San Luis Obispo Children’s Museum inspires learning through play for children ages 2-10, and is located at 1010 Nipomo Street in downtown San Luis Obispo. Visit www.slocm.org for admission and visit information. The Institute of Museum and Library Services is the primary source of federal support for the nations 123,000 libraries and 17,500 museums. Their mission is to inspire libraries and museums to advance innovation, lifelong learning, and cultural and civic engagement. To learn more, visit www.imls.gov. SAN LUIS OBISPO, CA (March 20, 2017) – The San Luis Obispo Children’s Museum Board of Directors recently welcomed five new members to its ranks, just as the organization realized all-time highs in membership & attendance, and made plans for new exhibits. Dawn Hinchman, Lindsay Waylett, Annie Braff, Courtney Anderson and Byron McFarland have each been elected to three-year terms. Newly elected officers include Ellen Drews (president), John Summer (vice president), Craig Filipponi (treasurer), Alison Bell (secretary) and Lindsey Haring (past president). Returning directors include Lisa Rizzo (exhibits chair), and Linda Minton (event chair). Dawn Hinchman has served on the Lucia Mar Foundation for Innovation, Central Coast STEM Collaborative, and SLO County Workforce Development Board Business and Youth Committees. She also served two terms on the Lucia Mar Unified School District Board of Trustees and currently coordinates Science After Dark. Lindsay Waylett is a Commercial/SBA lender with Premier Valley Bank who has been in banking for 15+ years, resides in North County and is a mom and wife. She also has years of service on the SLO County CASA board. Annie Braff has over ten years of new business development and marketing experience and served on the Young Professional's Board for Starlight Children's Foundation. Annie lives in San Luis Obispo with her husband and three-year-old son. Courtney Anderson is the owner of Cash in the Closet, an online consignment boutique, and Spark'l Apple Watch bands. She graduated from Cal Poly in 2005 with a degree in Communication Studies and lives in San Luis Obispo with her fiancé and two step daughters. Byron McFarland is Old San Luis BBQ’s General Manager and an advocate for downtown businesses. He received a degree in physics from Cal Poly and lives in Grover Beach with his wife. More than 650 families are now members of the Children’s Museum. Members receive unlimited visits, discounts for birthday parties & guest admission, and half off admission at more than 200 children’s museums nationwide. The Children’s Museum will be launching a Western Town exhibit as well as a Central Coast Pediatrics-sponsored renovation of the medical exhibit. Additionally, October 27th has been set for the Museum’s costume benefit. To receive program, exhibit and event information, sign up at www.slocm.org. The San Luis Obispo Children’s Museum inspires learning through play for children ages 2-10, and is located at 1010 Nipomo Street in downtown San Luis Obispo. San Luis Obispo, CA—The San Luis Obispo Children’s Museum’s annual benefit is known for being packed with the fun and unexpected, and this year’s event will not disappoint. Guests are invited to dress in costume and come prepared to dance, dine and play at the Museum’s space-themed fundraiser starting at 5:30 p.m. on Friday, October 28th at the Vet’s Hall in San Luis Obispo. KSBY’s Scott Daniels will serve as the evening’s emcee and Cody Dawson as auctioneer. Unique live auction packages include an ultimate child’s birthday party and sleepover at the Children’s Museum, a “Bucket List” adventure package, and three amazing getaways. All proceeds will benefit the museum and its ongoing programs, interactive exhibits and community events. “We will be honoring past-president and longtime board member, Shelley McConnell, for her generosity, years of hard work and inspiring leadership,” said Michelle Jenkins, the museum’s executive director. This event would not be possible without the generous support of dedicated event sponsors, led by presenting sponsor, Central Coast Pediatrics. Special thanks also go out to ACI Jet, Glenn Burdette, Lindamood-Bell Learning Processes, iii DESiGN, Autozone, Opolo Vineyards, SLO Brew, RSH Construction, Dignity Health, SESLOC Federal Credit Union, Sinsheimer Juhnke McIvor & Stroh LLP, Premier Valley Bank, Bill Gaines Audio, Associated Backflow, Inhouse Security Service, Tolosa Press, and Hep Kat Clothing & Beauty Parlor. Tickets are $100 per person for this adults-only event. For more information and to purchase tickets, call (805) 545-5874 or visit www.slocm.org/space-the-final-funtier. SAN LUIS OBISPO, CA (Jan. 27, 2016) – The San Luis Obispo Children’s Museum Board of Directors recently welcomed two new board members to its ranks, just as the organization saw all-time highs in members and attendance during 2015. Wells Fargo Bank’s Linda Minton and Jessica Chavez of El Dorado Broadcasters have each been elected to three-year terms. Newly elected officers include Lindsey Haring (president), Ellen Drews (vice president), Craig Filipponi (treasurer) and Carla Swift (secretary). Returning directors include Marsha Lifter, Alison Bell, Lisa Rizzo and John Summer. The Children’s Museum just concluded a record-breaking year. Close to 600 families are now members of the Children’s Museum. More than 50,000 guests visited the Museum, many on field trip scholarships or through free-pass partnerships with local nonprofits. In addition, the Children’s Museum welcomes all community members to enter for free during “Moonlight Hours,” offered the third Thursday of every month from 5 to 8 p.m. The Children’s Museum will be rolling out a half dozen new and improved exhibits during 2016 and will host its annual fundraiser in October. Sign up for monthly eFlyers at www.slocm.org to receive the latest news on these exhibits, as well as programs and exciting community partnerships. The San Luis Obispo Children’s Museum inspires learning through play for children ages 2-10, and is located at 1010 Nipomo St. in downtown San Luis Obispo. Guests are invited to dress in costume and come prepared to dance, dine and play at the Museum’s Day of the Dead-themed fundraiser starting at 5:30 p.m. on Friday, October 9th at the Vet’s Hall in San Luis Obispo. The incomparable Betsey Nash will serve as the evening’s emcee and Jim Glines as auctioneer extraordinaire. All proceeds will benefit the museum and its ongoing programs, interactive exhibits, member activities and community events. “We’ll be dancing to DK Malik, eating a themed dinner and bidding on fantastic live auction packages – including a luxury Mexican vacation for ten, a food-lovers package and an ultimate child’s birthday party at the Museum. We will also be honoring past-President, Allison Alltucker, for her years of hard work before, during and after construction of the “new” Museum,” said Michelle Jenkins, the museum’s executive director. The silent auction will again be placed online due to its success last year and for greater community reach. View and bid on items and cool experiences at www.biddingforgood.com/slocmauction. The mission of the San Luis Obispo Children’s Museum is to inspire learning through play. This fundraiser ensures that the museum is around for families to enjoy for years to come. Of course, this event would not be possible without the generous support of dedicated event sponsors, led by presenting sponsor, Lindamood-Bell Learning Processes. Special thanks go out to Glenn Burdette, iii DESiGN, Cannon, Heritage Oaks Bank, Opolo Vineyards, PrintPal Promotions and Printing, Jeff & Cheryl Priolo and DiBuduo & DeFendis, Cindrich & Company, Dignity Health, Central Coast Oral & Maxillofacial Surgery, SESLOC Federal Credit Union, Sinsheimer Juhnke McIvor & Stroh LLP, Premier Valley Bank, Bill Gaines Audio, Inhouse Security Service, Hep Kat Clothing & Beauty Parlor, KSBY-TV, Coast 101.3-FM and Testa Catering. Tickets are $100 per person for this adults-only event. For more information and to purchase tickets, call (805) 545-5874 or visit www.slocm.org/noche. SAN LUIS OBISPO, CA (May 19, 2015) – Beginning June 1, local children registering for their first library card will also receive a free child’s admission to the San Luis Obispo Children’s Museum (SLOCM). More than 800 passes are expected to be distributed during the duration of the twelve month program. Children ages 2–10 who register for their first library card at any of the fifteen SLO County Library branches will receive a pass to visit the SLO Children’s Museum. The Children’s Museum and the County Library have collaborated in the past on the Library’s popular Summer Reading Program. In addition, the Library hosts events featuring the Museum’s Lindamood-Bell Imagination Playground. The mission of the San Luis Obispo County Library is to provide materials and services to people seeking knowledge, lifelong learning, and recreation, as well as to ensure that all patrons of the library may use those materials and services to the maximum extent possible. The San Luis Obispo Children’s Museum inspires learning through play for children ages 2–10, and is located at 1010 Nipomo St. in downtown San Luis Obispo. Visit www.slocm.org for open hours, program information and more. 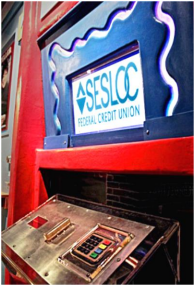 SAN LUIS OBISPO, CA — SESLOC Federal Credit Union, who believes it’s never too early to teach children about money management, is sponsoring the Zoomtown ATM at the SLO Children’s Museum. Zoomtown is the name of the museum’s second-floor mini village, where the ATM has been a popular stop since the museum reopened in 2008. The ATM, familiar for its brightly colored keys, engaging display and interactive screen, allows guests to slide a numbered ATM card and enter a PIN to begin a transaction. The screen prompts children to calculate simple banking transactions that debit from their pretend “account,” exposing them to basic banking and math terminology. A bank teller counter with a calculator, abacus and room for deposit and withdrawal slips is located adjacent to the ATM. SESLOC Federal Credit Union, with 37,000 members, 119 employees and assets of $632 million, has been serving people in San Luis Obispo County since 1942. It is a full-service financial institution with branch locations in San Luis Obispo, Paso Robles, Arroyo Grande and Atascadero. For more information on SESLOC, visit www.sesloc.org. The mission of the San Luis Obispo Children’s Museum is to provide a fun place for children and families to explore, discover and learn through hands-on exhibits and programs. Visitor information including admission pricing, exhibits and activities is available at www.slocm.org. Guests are invited to don 40s attire and step back in time at the Museum’s USO-themed fundraiser starting at 5:30 p.m. on Saturday, October 18th at the Vet’s Hall in San Luis Obispo. “We’ll be dancing to Riptide Big Band, eating a themed dinner and bidding on fantastic live auction packages – including Grammy tickets, a custom pizza oven, and the chance to be a fighter pilot for a day. We will also be honoring past-President, Linda Rawlings, for her unwavering commitment to the organization,” said Michelle Jenkins, the museum’s executive director. In a new twist, the silent auction has been placed online for greater community reach. View and bid on items at BiddingForGood. Of course, this event would not be possible without the generous support of dedicated event sponsors. Special thanks go out to Glenn Burdette, iii DESiGN, GALA of the Central Coast, Trapezoid Construction, Cannon, Opolo Vineyards, Lindamood-Bell Learning Processes, SunRun, Dignity Health, Adamski Moroski Madden Cumberland & Green LLP, Central Coast Oral & Maxillofacial Surgery, SESLOC Federal Credit Union, Sinsheimer Juhnke McIvor & Stroh LLP, iPromote, MacSuperstore, Bill Gaines Audio, Doc Burnstein’s Ice Cream Lab, SLO Camp & Pack, Inhouse Security Service, Hep Kat Clothing. A Treehouse to Call Your Own! San Luis Obispo, CA — The Home Builders Association of the Central Coast (HBACC) is proud to partner with the San Luis Obispo Children’s Museum (SLOCM) to present a unique fundraiser benefitting both organizations: a Treehouse Raffle! Generously donated by Paso Robles-based Wood Family Carvers, the hand-crafted “tree” house and local installation are worth an estimated $10,000. Tickets are only $20 each and can be purchased by calling (805)545-5874, onsite at the Children’s Museum or by visiting the Home Builders Association of the Central Coast Facebook page. Only 750 tickets will be made available. The drawing will be held on September 14th at Via dei Colori near the Mission in downtown San Luis Obispo. Need not be present to win. About the Home Builders Association of the Central Coast - The Home Builders Association of the Central Coast is a non-profit California corporation – a trade association representing builders, developers and related industry professionals in San Luis Obispo and Santa Barbara Counties. About the San Luis Obispo Children’s Museum - The mission of the San Luis Obispo Children’s Museum is to provide a fun place for children and families to explore, discover and learn through hands-on exhibits and programs. Each year, the Children’s Museum is proud to offer tens of thousands of children, their families, caregivers and teachers a variety of educational experiences that enrich their lives. Program and activity information can be found at www.slocm.org or by calling (805) 545-5874. About Wood Family Carvers - Everything from home décor candle holders to one of a kind play environments. Wood Family Carvers is a family run chainsaw carving business, creating unique art pieces, as well as home and gardening décor. San Luis Obispo, CA — The San Luis Obispo Children’s Museum will soon be home to The Thinkery, a children’s museum-based preschool enrichment program serving two-and-a-half to five-year-olds. Led by director, Karen Ames, The Thinkery has been designed as a play-centered program that provides a unique environment where children can create, explore and discover. The Children’s Museum’s 8,400 square foot facility, which features an art center, outdoor playscape and three floors of exhibits, will serve as a backdrop to this unique learning experience. Registration is currently open for the 2014-2015 school year, which kicks off September 2, 2014. For more information about this program, tuition cost or schedules, please contact Karen Ames at (805) 239-9333 or karen@imaginariumfun.com. Additionally, meet Karen at the Museum from 10a.m. – noon on August 7th or 21st. Guests can don their Wonderland best and venture down the rabbit hole at the Museum’s annual fundraiser starting at 5:30 p.m. on Friday, October 11 in the Venetian Room at Madonna Inn in San Luis Obispo. “We’ll ‘begin at the beginning’ with appetizers, entertainment and fantastic silent and live auction packages – including an Alaskan fishing trip, a Tuscany vacation rental, tickets to the Indy Car World Championship and several surprises – all auctioned off by the incomparable Jim Glines,” said Michelle Jenkins, the museum’s executive director. The mission of the San Luis Obispo Children’s Museum is to provide a fun place for children and families to explore, discover and learn through hands-on exhibits and programs. Since opening in 1990, the museum has been committed to offering experiences that both invoke curiosity and imagination about the world and promote active exploration, investigation and creation. The Children’s Museum is proud to offer thousands of children and families, caregivers and teachers a variety of educational experiences that enrich their lives. And this event ensures that the museum is around for families to enjoy for years to come. Tickets are $100 each for this grown-up event, where guests can dance to jams courtesy of DJ Malik, enter a Wonderland costume contest, drink Opolo wines and enjoy a sumptuous Madonna Inn feast. This event wouldn’t be possible without the generous support of the Children Museum’s sponsors. A special thanks goes out to Lindamood-Bell Learning Processes, Glenn Burdette, iii DESiGN, Central Coast Oral & Maxillofacial Surgery, Opolo Vineyards, Jeff Priolo/Dibuduo & Defendis, The Tribune, Cannon, Sky River RV, MacSuperstore, Bill Gaines Audio and Arsenal Equipment Rentals. For more information and to purchase tickets, call (805) 545-5874 or visit www.slocm.org. San Luis Obispo, CA — The San Luis Obispo Children’s Museum is pleased to present a traveling exhibit dedicated entirely to bees. Expertly crafted by Arroyo Grande resident Karen Ames, The Secrets of Bees includes a wide variety of creative, interactive activities to help children appreciate this amazing insect that we frequently encounter and often misunderstand. Studying bees adds significantly to the wider education of children, specifically adressing: the food chain, the importance of pollination, the structure of societies, adaptation and engineering. In this exhibit, young guests will study a fascinating plexiglass “observation hive” set up with a looped video of a bee hive in action. Dressed like honey bees, they can “fly” to the garden of five foot tall flowers, gather pollen into their pollen sacks, then “fly” into the giant hive. In the hive, they will pack pollen and nectar into honey comb, make and fan honey, feed and care for larvae, clean and protect the hive, and tend to the queen. Children can also don protective keeper gear and work real wooden hives and then extract “honey” from the frames, fill honey bear jars and then sell the honey at a roadside stand. The Museum’s education staff will complement the exhibit with a wide variety of science and art programming. For more information about the San Luis Obispo Children’s Museum, visit www.slocm.org or call (805) 545-5874. SAN LUIS OBISPO, CA (December 15, 2012) – The San Luis Obispo Children’s Museum board and staff have been busy creating holiday magic!! Visit within the next three months to try out the exciting and novel Hurricane Booth. Read all about hurricane formation and naming criteria and then step inside the booth to experience the 80 mph winds of a Category 1 hurricane! $2 per experience. In addition, Rotary Club of San Luis Obispo de Tolosa has funded a brand new permanent exhibit, the Bernoulli Blower. Test different balls on an invisible stream of air as you experiment with Bernoulli’s Principle of air flow and pressure. The Children’s Museum is indebted to Rotary de Tolosa for their continuing support. December is also a great time to purchase any of the Children’s Museum’s four membership offerings. Through December 22nd, receive four free guest passes (a $32 value) and two beautiful hardcover children’s books penned by local author Pam Copeland when purchasing or renewing a membership. The Children’s Museum would also like to thank Kevin Harris and the San Luis Obispo Little Theatre for allowing us to host the November 29 performance of It’s a Wonderful Life. Children’s Museum members were treated to a spectacular performance many of whom were first time theater-goers. The San Luis Obispo Children’s Museum inspires learning through play for children ages 2-10, and is located at 1010 Nipomo St. in downtown San Luis Obispo. Program and activity information can be found at www.slocm.org or by calling (805) 545-5874.